Some timeshare owners think that their purchases are the best investment in future vacations they ever make, but they realize that they are terrible investments when they can no longer afford the payments, or they are never able to go to the destination, and that’s when they decide to get out of the timeshare anyway they can, and sell the timeshare is always the first choice. 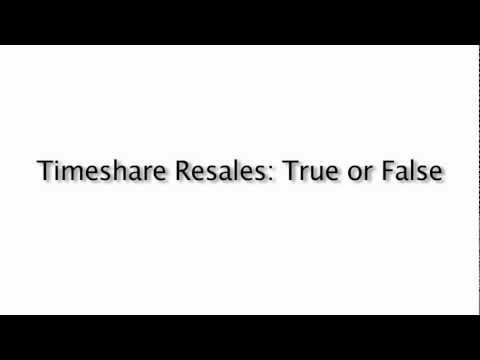 Read this article and know the truth about timeshare resales. Some fraudulent timeshare resales companies scam timeshare sellers with the promise that they have a person ready to buy their timeshare, or they assure that they can sell their timeshare easy. Beware of upfront fees: When a company asks for an upfront fee to sell your timeshare, be sure that this company is a scam. Legitimate companies do not charge you anything upfront for listing timeshare properties. “Hot” resale market: Be extremely cautious when something sounds too good to be true. Resale companies will tell you that the market for timeshare is “hot” and that there are lots of buyers waiting for your timeshare. Unsolicited phone calls: “I see you have a timeshare. Do you want to sell it?” This is the common expression used by these companies when they contact you. If you have never contacted that company and they call you first, it is a red flag. Unrealistic prices: When they offer you to sell your timeshare, they promise to sell it at a high price, even the double that you paid. Just like these, there are many more , but making a research these are the most popular and most scammers. First of all, they will contact you by phone telling you that you can sell your timeshare for an incredible price, because the resale market is “hot” and there are lots of buyers. Once they convinced you they ask you for money upfront, this is for the closing costs, the sales fees, etc. When you pay them, they call you again and ask you for more money to accomplish the process. Once you pay them again, they disappear, if you try to contact them, you will notice that the phone number is disconnected and they do not answer your emails; the company just ran away with your money and you won’t hear from them never again. These companies change their names, web pages, phone numbers and emails frequently. This is because once they scam some owners they change their information to scam many more owners. These companies does not exist, don’t have a building when you can go, they only make contact by phone, and only lasts from 6 months to 1 year before they change their names again to keep scamming people. Gold Rule: Never trust in any company that asks for money upfront. If you have a timeshare you don’t want, the best solution is the timeshare cancellation. Once you cancel your timeshare you won’t have any relation to the resort. At Mexican Timeshare Solutions, we can help you to cancel your timeshare. With associates very experimented in the timeshare industry, we can help you get out of your situation. Contact us for a free consultation on your timeshare matter. Hola, le ofrecieron a mi mamá una suma alta para alquilar sus semanas de su tiempo compartido en Estados Unidos, la entrega del dinero se hará por una empresa ecsg y la empresa se llama travel right LLC. Ya le pidieron un monto de dinero para un tema de impuestos en México, lastimosamente ella ya lo canceló, supuestamente el dinero estaría en un fideisomiso del banco Banorte, pero no conformes ahora le siguen pidiendo otra transferencia por un monto mayor, no sé cómo hacerle entender que de seguro es una estafa. Tienen alguno información por favor? Dont believe in that, is totally a scam ! the best to make the cancellation as quick as possible, timeshare field never gonna be a good investment at all, so please stay away from timeshare presentations. Dont get caught , timeshare never gonna be a good investment , so just dont accept to go to a timeshare presentation , free gifts are only part of the hook , dont look back an go on, trust me , timeshare field is a nightmare ! Fraud in general and specifically of timeshare are the order of the day. Customers should be cautious and not be fooled by false promises about investment returns, timeshare resales or anything that sounds too good to be true. I receive calls from a company constantly. I have asked to be removed from their call lists but continue to get calls. They call all hours of the day and night and I cannot manage to make them cease. I am hoping this is the next step. A company called us to offer to sell our timeshare stating we could get the market value of $16, 000 to $18, 000.00 if we listed with them. Plus, he told us if we paid the fee and listed with them they would guarantee the sale in 10 months or buy it themselves for the market value. After 10 months, and many additional letters and phone calls, they offered us $7.00 for our timeshare. DO NOT DO BUSINESS WITH THESE PEOPLE, THEY ARE COMMITTING FRAUD AGAINST THE UNSUSPECTING PUBLIC. I am thinking of going with Global Marketing Connections. I am not sure yet if this is all a scam.. but if I can find a few people who love it and are making some money..I wont feel as worried as i do now. I can't understand anyone paying anything upfront to do with timeshares. I frequently get calls from different firms telling me they've got a buyer for my timeshares and they don't want any money upfront! I listened to the first few callers, but just put the phone down now. I have recieved several phone calls to sell my timeshare. This was a foolish thing to do but I parted with the money. I heard nothing until the 2 phone calls last week. Today I recieved a call from them with threatening me with court action if I don't pay the annual subscription. Is this a bluff to get money? I own a timeshare at Club Melia in Cozumel, and the truth is that I want to get rid of it. They told me to do that the only way is by timeshare reslaes but I don't want to because I don't trust these scammers. I don't know if you can help me.